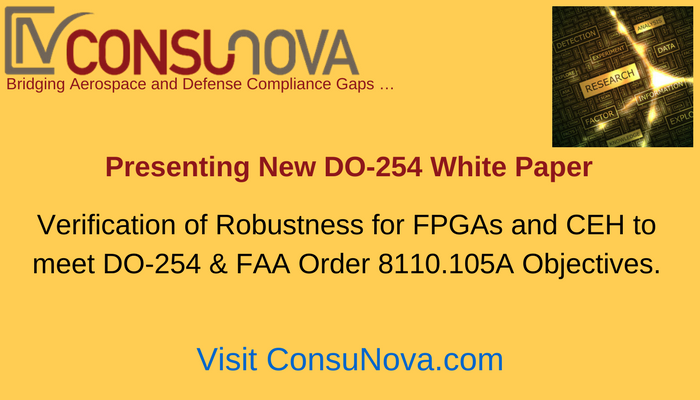 ConsuNova releases a new DO-254 whitepaper "Verification of Robustness for FPGAs and CEH to meet DO-254 & FAA Order 8110.105A." "ConsuNova teaches over 500 hundred engineers and managers every year how to successfully achieve DO-254 and / or DO-178C compliance. We felt strongly that this newest white paper addresses a key, but often misunderstood aspect of DO-254 compliance and certification," said Reza Madjidi, CEO & FAA Consulting DER at ConsuNova, Inc. The DO-254 verification of Robustness is conceptually simple, once the reasonable set of "abnormal operating conditions" has been established. During testing those conditions are created and the FPGA/CEH response noted. Depending upon the system requirements, sometimes the FPGA/CEH response isn't required "to work normally" but should at a minimum return to normal operation once normal conditions are reestablished. Part of the analysis is to establish acceptable FPGA/CEH responses to the "abnormal operating conditions". Some of the acceptable responses may actually affect the LRU/CCA hardware performance or software functions hosted on the system, an early identification of such interdependence is essential for the planning of robustness testing. The understanding and identification of FPGA/CEH component robustness is described as the ability of the FPGA/CEH to tolerate or respond to abnormal operating conditions. In practice, this description is somewhat open-ended. This paper establishes a reasonable boundary or limit for defining the abnormal operating conditions and how to account for them. Reza Madjidi, ConsuNova CEO and FAA Consulting DER, adds, "The discussions and examples presented in this DO-254 whitepaper are not representative of the only methodology which will address the Verification of Robustness. They represent ConsuNova's best practices delivered to many of our clients worldwide and should be used as a guide to establishing processes and policy which integrate with specific project resources and documentation." Section two - presents methodologies for verification of environmental robustness aspects. Section three - presents methodologies for tool based analysis. Section four - presents three examples of a methodology to analyze FPGA/CEH functions, determine and document Functional Robustness aspects that need to be covered. Within this section, a common FPGA/CEH function is described and will be used as an example. Section five - introduces additional topics which are tightly related to the implementation of robustness verification. ConsuNova continues to thrive bringing effective compliance solutions and services to the aerospace and safety-critical industries. Visit https://www.consunova.com/services.html to learn more about this whitepaper, our extensive DO-254 & DO-178C Training Courses and more. ConsuNova is a leading global provider of certification, compliance engineering services and solutions for safety-critical systems to the aerospace and defense industries (https://www.consunova.com). ConsuNova provides ARP 4761, ARP 4754A, DO-200A, DO-254, DO-178C Compliance Solutions faster & in the most cost-effective way.